Growing up in Stellenbosch, or rather on the outskirts of Stellenbosch, the divide between the ‘proper’ town and the suburbs were obvious, and it remains very similar today, 22 years after democracy. So how do we innovate to the benefit of all inhabitants of Stellenbosch? Admission of the problem is half the answer, but attitude and behaviour changes are required! So the question is what to do to change the status quo? So is it a STELLENBOSCH municipality maintaining the OLD or is a STELLENBOSCH municipality embracing the NEW? Let’s take each one and create a pathway for each that are workable and practical, after all municipalities have the mandate to deliver basic services. Easy on the ear, difficult to build but even more difficult to maintain. So what partnerships are happening? How do we make it work better and smarter? How do we leverage these partnerships? 7. And the municipality should lead by example. The latest buzz word, perhaps, yes, but so difficult to do and even more difficult to implement. Tax payers’ monies at work, and tax payers therefore can have an opinion and can complain. A compliment is rare! Understand and explain, what a municipality can do, and not do. Be clear. Be concise and be straight. Do less, but ensure it is done properly. Ensure that councillors and municipal staff (even service providers) understand service delivery. Ensure that community engagements are properly managed. Make sure the citizens are informed about the budget and target community leaders to inform them. And stick to the plan, no matter how difficult. The biggest challenge in communities in South Africa remain jobs and the inability of young people to obtain employment. The challenge in Stellenbosch is the dispersed nature of the demands. Youth on farms are isolated by the nature of their locality, the youth in the suburbs are isolated by race and by socio-economic circumstances. And yes, the basic services remain the mandate of the municipality, but the tax base needs to grow. But above all, businesses (small and big) setting a target for youth employment? It is recognised that the municipality cannot do this through the ‘normal’ channels and so the boldest step or approach is to rethink the current structures and to realign it to signal a change in the way business will be done. What about a Youth Council? What about a platform for partnerships? And what about the redesign of access to opportunities? 4. Academic institutions should reserve bursaries and ‘place’ for municipal based students. Stellenbosch remains divided, with clear racial associations, and the ultimate challenge is to change the race-based settlements. But what to do, as the design of the past also creates social cohesion and support in time of need. So understanding the system of support and also the system of operations within the suburbs is imperative but how? Cultural diversity creates the biggest opportunity to change the way we do business and yet, mistrust and perceptions are most difficult to overcome. 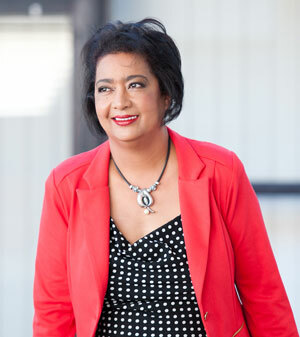 Joyene Isaacs completed her schooling at Lückhoff Senior Secondary School in Stellenbosch in 1982 and then registered at the University of the Western Cape for a B Sc. degree with Plant Protection and Plant Pathology as majors. She continued with Plant Pathology as a major and completed the B Sc. Hon in 1986. She worked for two different NGOS, in agricultural development, in three provinces from 1991 to 1996. She joined the Agricultural Research Council in 1996 at INFRUITEC as a centre co-ordinator for the resource-limited farmers’ programme. The job entailed the management of a team from the Institute working with resource-limited farmers and the development of effective linkages with all role players to ensure an appropriate research agenda for fruit production and processing systems for the emerging sector in South Africa. In 1998, she was appointed as the assistant-director: Resource-limited Producers’ Programme, managing a bigger team and taking on the responsibility of both Infruitec and Nietvoorbij campuses. She was appointed at the Department of Agriculture: Western Cape in 2002 as a Director of Farmer Settlement, and in 2004 as Chief Director: Farmer Support and Development. The key functions entailed the development of the emerging sector through land reform, infrastructure development, farm worker development, food security initiatives, capacity building of grass roots farming organisations, ensuring equity (internally and externally) and building innovative and strong partnerships. The programme grew substantially under her leadership i.e. the budget increased from R 7 million to R 70 million over four years and the staff from 7 staff members to about 180 staff members (technical and administrative). In December 2005 she was appointed Acting Head of Department for the Department of Agriculture, managing more than 800 staff members through 7 programmes and giving effect to agricultural development in the Western Cape to the benefit of all. In March 2006, she was permanently appointed as the Head of the Department on a four-year contract, which ended in March 2010, and was extended to March 2015 and again renewed to 2020. She has published and presented a range of publications, from scientific to development papers and attended various conferences, seminars and workshops where she facilitated and chaired different sessions. She served as chairs for many organisations i.e. President of the Southern and Eastern African Association for Farming Systems Research and Extension (14 African countries); NGOS and currently is the chair for the Wine Industry Transformation Committee.